Since Jackson Pollock’s death in 1956, the man and his achievement have spawned myriad interpretations. They range from the most scholarly tomes, such as the artist’s catalogue raisonné (1978), to studies of single paintings, crucial anthologies like those that MoMA published in the wake of its 1998 Pollock retrospective, endless pedestrian monographs and a monumental biography by Steven Naifeh and Gregory White Smith. By contrast, Pollock’s Modernism belongs to a special category: the academic. Originating as a PhD thesis, the book should have been thoroughly transformed into a readable narrative. Instead, the chapter titles—among them “Autonomy”, “Automatism” and “Projection”—signal that the author, Michael Schreyach, an associate professor at Trinity University in San Antonio, Texas, does not wear his learning lightly, nor fight shy of repetition. Over and again, the text refers to “modes of pictorial address” and “forms of beholding”, while the verb “attend” invariably replaces “seeing”, “considering” and other more straightforward ways of stating a complex case—for nobody need deny the complexity of Pollock’s art. Indeed, this is all the more reason for seeking to unravel it with clarity—rather than in sentences typified by the following effort to elucidate a classic Pollock: “… the simultaneous effect of soliciting a viewer’s attention by openness, yet delaying his projective gaze from entering into ambiguous depth by establishing the virtual resistance of an intermediary plane”. Here a rare slip of the pen also occurs, despite a laudable bid to reverse decades of sexism by describing the hypothetical viewer almost throughout as “she” and “her”. The male chauvinist Pollock would have been amused. The problems run deeper than mere writing style. The latter emulates T.J. Clark’s idiosyncratic mix of ostentatiously close reading (we learn that fibreboard has “two modes of existence that are ontologically distinct”) and the first person singular (“I’ll” say this or that), as though the casual speculative self redeems the pedant’s dryness. At root, the basic scholarship of this new study—which assumes that rephrasing what is already well known somehow renders it ingenious and fresh—often appears dubious. 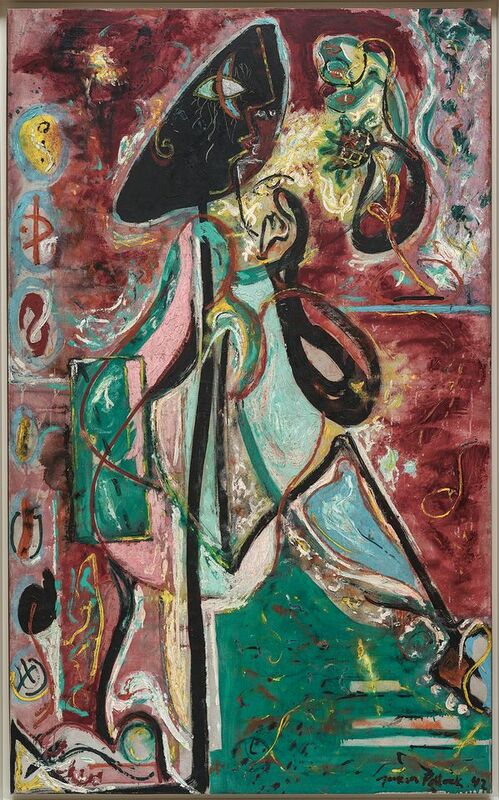 For example, The Moon Woman (1942), singled out for special treatment, is no more key for Pollock’s later work than other canvases from the period—Male and Female, Guardians of the Secret and Pasiphaë have equal or greater claims to that status. Likewise, the author’s analysis goes so far as to propose that the Moon Woman dips her foot into oceanic waters to test them. Yet nowhere does Schreyach acknowledge that the image’s prime source is Picasso’s drawing Bather and Cabana (1927). Consequently, Pollock’s iconography gets misread. Similarly, it is true that the epochal Mural (1943) was installed in the long, narrow hallway of Peggy Guggenheim’s townhouse. Nevertheless, little or nothing suggests that he plotted it with anamorphic perspective in mind, like Holbein’s famous skull in The Ambassadors. Hence Schreyach dodges the dodgy idea (despite some good passages on Siqueiros and Holbein) by inventing a novel notion—“generic” as opposed to “specific” anamorphosis. In fact, the phenomenological import of Mural is that its sheer size, allied to how close up it had to be seen, meant that for the first time the onlooker was perforce “in” the painting. Several pages focus on the “table” motif in early 1940s compositions, oblivious to its derivation from Orozco’s Table of Universal Brotherhood mural (of which Pollock owned a photograph). Overall, too, photography’s critical importance to the artist is short-changed. In conclusion, this book evinces much scholarly dedication and concerted theorisation. Even more work would be needed to make it readable and altogether convincing. A wit might add that it promises to become a favourite set text in academe.